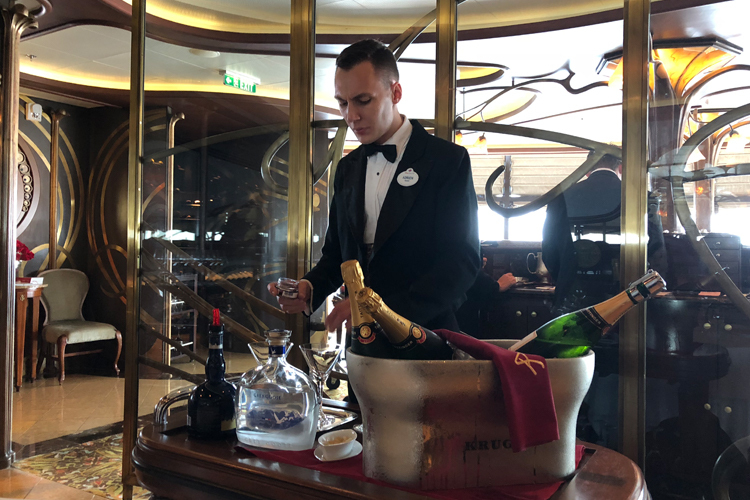 Aboard the Disney Cruise Line ships, there are two adult-exclusive restaurants. There is Palo, which serves Italian cuisine, and then there is Remy, which serves French cuisine. Remy was inspired by the Disney-Pixar animated film Ratatouille, and this establishment is in a league of its own. 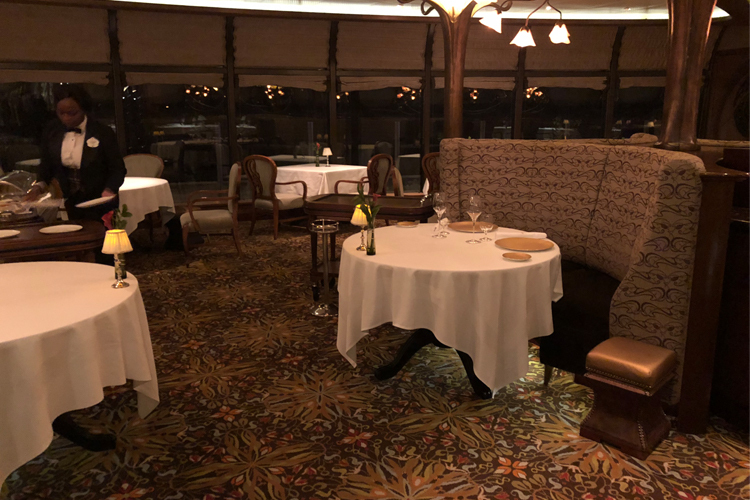 That isn’t a knock on the rest of the dining options aboard the Disney ships, rather it speaks to the magnificence of Remy. While big Disney fans can spot the minor details, the theming and references to Ratatouille are very subdued. The restaurant features a panoramic view of the ocean, yet it remains very warm and elegant with dark woods and dimmed lighting. The restaurant was much smaller than you might expect. This likely allows them to focus on the quality of the food rather than the quantity, but after dining in the massive rotating dining restaurants you may be surprised at just how small Remy is. Towards the back of the restaurant there is a wine case which creates a secluded dining area. Featured in the case are several fine wines, including a 1961 Château Latour and a 1947 Cheval Blanc – both wines are featured in Ratatouille. As you approach the entrance to Remy you are immediately met by a host and an accompanying server. The server slowly walks you to your table while pointing out the interesting details of the restaurant. As you sit down your chair is pulled out for you by someone on the staff; next, they lay the black or white cloth napkin onto your lap. Once again you are welcomed to Remy, and you are served a complimentary cocktail, which is a Colette made with Absolute Pear Vodka, a splash of Taittinger Champagne, and mixed with mint, a raspberry, and dried apricot. The taste of Taittinger Champagne really carries through the entire drink. Following the Colette, you are served a dainty basil palate cleanser just before the bread is served. On a personal note, I had the baguette, which tasted similar to popcorn, and I don’t mean that disparagingly. It was very light, buttery, and had a hint of salt. Soon after you finish the palate cleanser the servers come in with the menus. 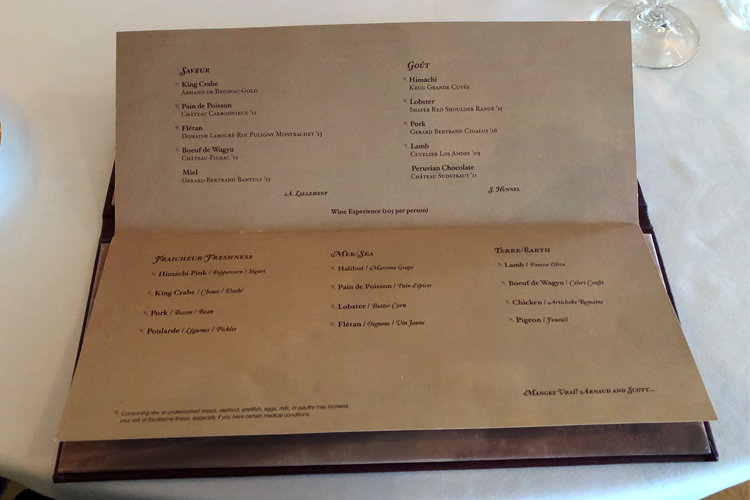 The menu is quite unique; half of it was put together by Chef Scott Hunnel from Walt Disney World’s Victoria & Albert’s, and the other half was created by Chef Arnaud Lallement from L’Assiette Champenoise. The two options are either the Saveur menu or the Goût menu. 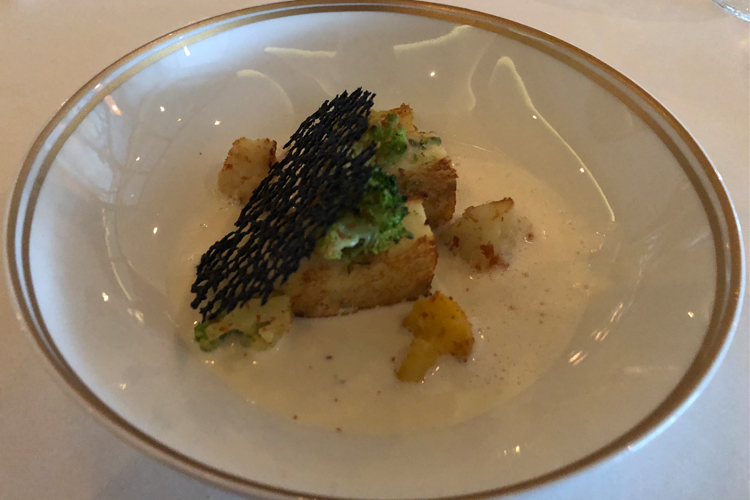 While each menu was designed to pair with the entire course, if there is something on the menu that doesn’t look appealing to your palate you can opt to get each course à la carte. I choose the Saveur menu, which I was somewhat apprehensive about because while I like seafood it isn’t always my first choice, and three out of the five courses on this menu are seafood. The first dish was King Crab. The presentation was not at all what I was expecting. 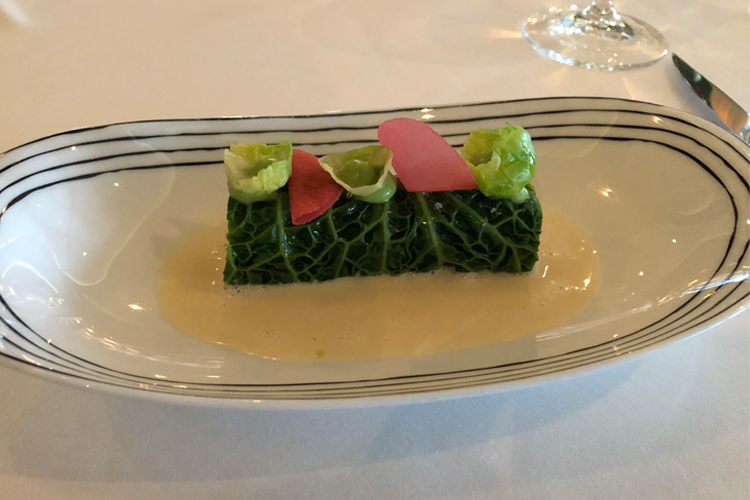 The crab was wrapped tightly in greenery, making it look like a log of seaweed. Unfortunately, this was my least favorite dish. I ate it, and I wouldn’t go as far as to say it was unappetizing, it just lacked flavor and was very bland. This wasn’t the standard for the rest of the courses because things quickly changed. Next was the Pain de Poisson. Which turns out to be a fish loaf, which may sound repulsive, but it was honestly the best course of the meal. It was incredibly light and fluffy, with a gingery layer on top. The sides had bread crumbs with gave it a nice texture. This is something I likely would have never ventured to try anywhere else, but the servers ensured that I would enjoy it, and I am glad that I did. This is something I will seek out on other menus now to see if it lives up to the high bar that Remy set. After I finished the Pain de Poisson I was served Flétan, which was a halibut. 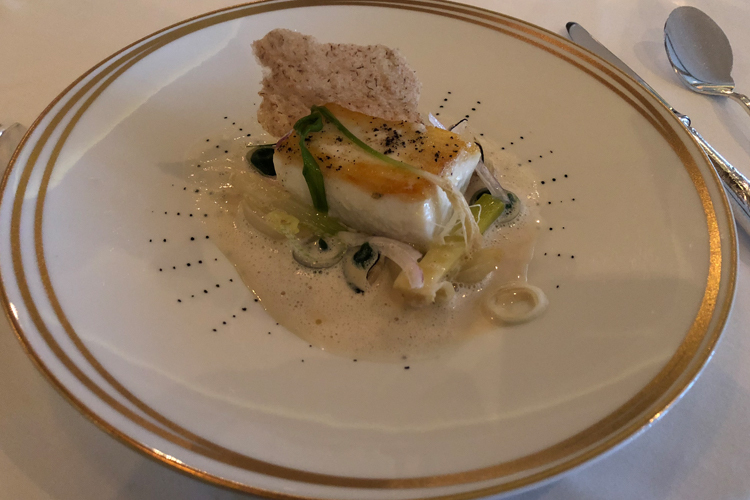 Served on a light bed of leeks, the halibut created a brilliant presentation and tasted even better than it looked. It was incredibly savory and was very flaky. Each bite fell apart in my mouth. At this point, I really began to realize how special Remy was. Following the halibut, I had the Waygu beef. It was a small cut of meat, but what was there was extremely tender. The flavor coated my entire mouth after one bite. While the beef was delicious, I will warn you that the brown garnish on the side is an olive paste, which was very potent, and something I did not enjoy at all. 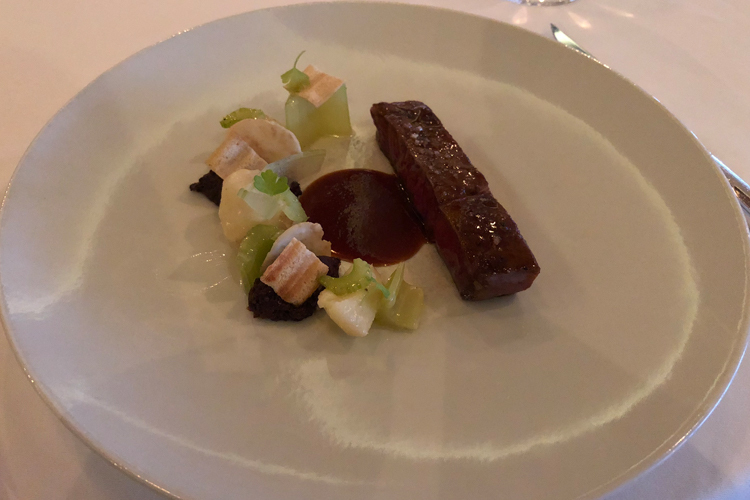 In complete honesty, I ordered from the Saveur menu simply because I wanted to try this Waygu beef dish, and while it was extremely flavorful and enjoyable, it was probably only my third favorite course after the Pain de Poisson and the Flétan. 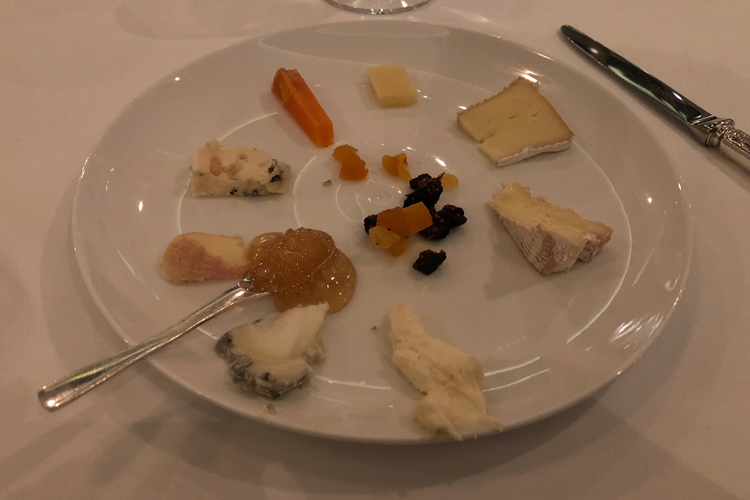 Once your main courses are finished the server wheels in a cheese cart, which features a wide variety are boldly flavored cheeses, dried apricots, dried figs, and honeycomb. These cheeses are robust to the point that some of the very strong flavors can be too much for some guests. While the cheese plate won’t be everyone’s favorite course, it is a unique experience to venture out and try something you’ve never tried before. The meal concluded with dessert. I had the Miel, which was a honeycombed wafer raspberry tart. I love tart desserts, so I knew from the get-go that I would likely love this dish. It went above my expectations. It was sweet but didn’t leave a gross sugary coating in my mouth. 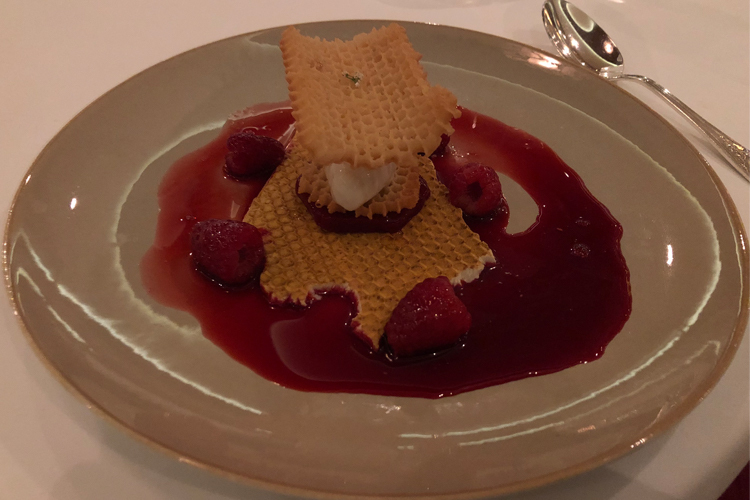 The honeycombed wafer gave the dish a good base, but let the raspberry and dab of ice cream create the flavor. The service at Remy was remarkable. The servers cater to almost any request or preference. They are tremendously dedicated to the artistry of their job. What impressed me the most was that the entire meal was like a dance routine for these professionals. Every move they made almost looked choreographed and timed. This may sound hyperbolic, but it is not. Every dish, utensil, or drink that was put on the table was part of a synchronized routine. The servers were highly skilled and incredibly knowledgeable. If you had a slight question about any dish they were prepared with a well-informed answer. At the end of the meal, the chef greeted our table and asked us if we enjoyed everything. At first, it was assumed the waiters may have tipped him off because we had a couple cameras, but he proceeded to greet every table in the restaurant. It was wonderful to thank him for his incredible cooking and to see the pride he took in his work. For many, Remy is a once in a lifetime type of dining experience. The service was magnificent, the food was unbelievably flavorsome, and the atmosphere really made the entire meal feel extravagant. Dining at Remy is more than just having dinner — it is a special event. While the food was spectacular, it was the service that really made Remy into something extraordinary. Disney Cruises are expensive, and splurging an extra $99 per person can be out of the financial budget for many. 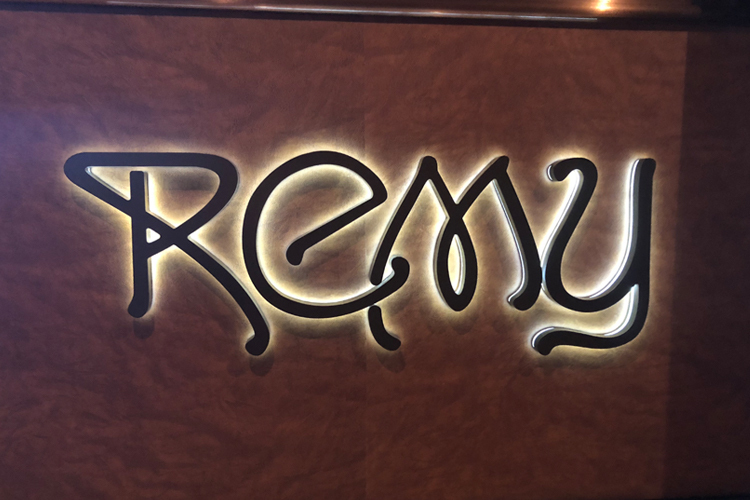 If you have the money, Remy is something I would highly recommend trying at least one night, because it is a tremendously special dining experience. This is the perfect meal to celebrate a special occasion like a wedding anniversary, a significant raise, or a special birthday dinner.